Pápai Páriz Ferenc, Album amicorum p. 225. Trajecti Caucorum ad Visurgim a. d. X. Kal. Oct. a. MDCCXIV. 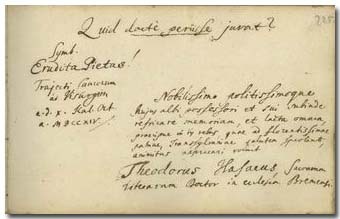 Theodorus Hasaeus, Sacrarum Literarum Doctor in Ecclesia Bremensi. What is it worth to die erudite? Theodor von Hase was born in Bremen on November 30, 1682, a son of the theologian Cornelius von Hase (1653-1710) and of Sara Wolters (?-1710); his mother was also renowned of her theological and Hebrew knowledge. Theodor studied in the high school of Bremen, where in 1701, at the age of 19 he accomplished a theological dispute under the chairmanship of his father. In 1702 he went to Hessen, then to Kassel and Marburg, and with a second dispute he obtained pastoral diplom. After further studies at the academies and universities of Hanau, Herborn, Duisburg, Utrecht, Leiden and other places, he returned to Bremen, and there he became assistant pastor of the Liebfrauenkirche. In 1707 he was professor of biblical philology and classical literature in Hanau. In 1708 he became preacher in the same church of Bremen, and professor of Hebrew in the local high school. In 1712 in Frankfurt an der Oder he was granted – in his absence, on the basis of a treatise of him – doctoral degree in theology, and in 1723 he was appointed professor of theology at the university of Bremen. He was also invited to Franeker, but remained in Bremen. From 1718 he was member of the Scientific Society of Berlin. From 1729 on he suffered a series of strokes. He died in Bremen on February 25, 1731. Between 1719 and 1727 he continued in Bremen the series Bibliotheca historico-philologico-theologica, which had been started in Amsterdam. Our Library preserves, among others, his dissertation De oraculo Lamechi (Bremen, 1712). His shorter historical, exegetic, dogmatic and other theological works and inaugural addresses were collected and published after his death: Dissertationum et observationum philologicarum sylloge. Bremen, 1731. Theodor von Hase, just like Gottfried Jüngst (p. 216), uses the ancient name of Bremen in the dating: Trajectum Caucorum ad Visurgim, that is, the ford of the ancient German tribe of Cauci over the Weser (Visurgis).